On Saturday, September 9th, Eugenia Kim presented a collection that was fun, artsy, and full of attitude. Some of the looks recalled ’80s Nagel illustrations: stylized, geometric, clean, with ample use of pastels. The show was held at Pier 59, marking the first time that the label is showing at New York Fashion Week. 2018 marks the label’s 20th anniversary and the brand kicks it off with an ode to the allure, strength, and unapologetic independence of the Eugenia Kim woman. 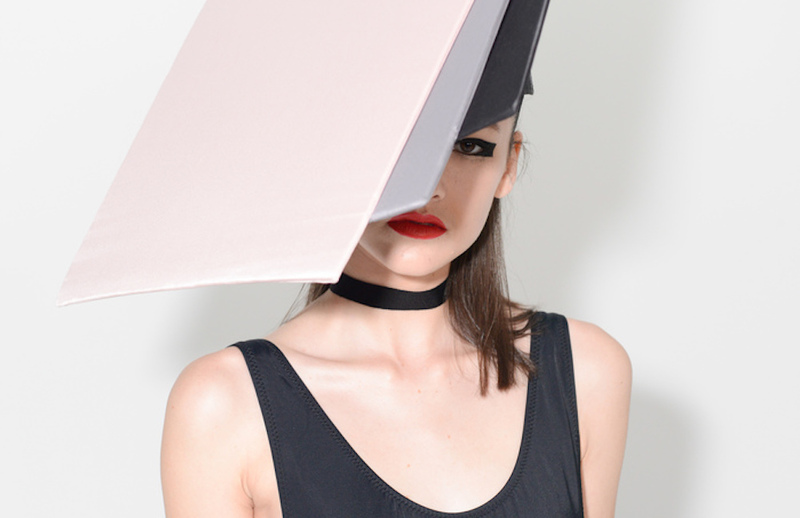 The collection was nothing but fun: we adored the simplicity, geometry, and color blocking. The Matisse-esque art touches (again by way of Nagel) were also beautiful. we adored the simplicity, geometry, and color blocking. Entitled “In Your Dreams,” the presentation included headwear, footwear, and the recently launched handbag collection. The collection is comprised of 20 looks that include extravagant tulle hats, geometric colorblock headpieces and shoes, oversized bows, and stand out feather-covered pieces. Spring/Summer 18 is inspired by the distinct work of American artist Patrick Nagel, whose 20th century-influenced Art Deco illustrations depict bold and graphic images of women and the female form. Endlessly desirable yet eternally out of reach, the Nagel woman invites you to look, but never touch. After a cafeteria-tray ride down a snowy hill landed her a month-long stay in the hospital, Eugenia’s newfound dislike for these institutions did not agree with her pre-med track at Dartmouth University. Following graduation in 1996, Eugenia moved to New York to explore a different career path. She took a position at Allure magazine, while simultaneously taking a millinery class at Parsons School of Design. In 1998, after a bad haircut, Eugenia created a feathered cloche to wear as a disguise. Boutiques in her downtown New York City neighborhood immediately took notice of the inventive design, and soon after, Barneys New York placed their first order. As a result, the Eugenia Kim brand was born. The brand quickly grew in popularity, and Eugenia soon learned that she could not limit production to her small East Village three-roommate loft. She opened her first retail boutique, where she designed and sold hats in the storefront by day, and slept in a small room in the back at night. Eugenia Kim became fashion’s go-to headwear brand, being featured on the covers of top publications including VOGUE and W Magazine, and on-screen in blockbuster films such as Zoolander and The Beguiled. Celebrities Beyoncé, Jennifer Lopez, Madonna, Gwen Stefani and countless others also took notice, choosing the brand for red-carpet appearances, headwear for concert costumes and to offer a stylish way to shield their faces from paparazzi. Launched as a millinery collection, the brand has since expanded its offering into other categories of soft accessories, including a diffusion line, Genie by Eugenia Kim. In 2004, Eugenia introduced her highly coveted footwear collection, which was later re-launched in 2014, and followed with an expansion into bags in 2017. Headquartered and handmade in her New York City studio, Eugenia Kim is sold at luxury retailers such as Bergdorf Goodman, Barneys New York, Harvey Nichols, Net-a-Porter and Saks Fifth Avenue, in addition to over 300 other department stores and specialty boutiques worldwide. Eugenia has been awarded the honor of ‘Accessories Designer of the Year’ by the CFDA.